Last year on January 24th I failed to find a new bird in the Bird-a-Day Challenge, and the game was over for the year. Yesterday I didn’t go out birding, so I had to pick something from the day’s yard list. My bird of the day was the American Robin; and so the game continues today with my first day birding at the Space Coast Birding & Wildlife Festival. Strategy dictates that the “best” bird of the day is chosen for the challenge, and that typically means the rarest bird that hasn’t been used for the challenge so far. Very often, it’s difficult to pick which bird to add to the list – and remove from the taking as the game progresses. I picked American Robin yesterday because I had already used up some of the “better” birds previously in the game: Gray Catbird and Cedar Waxwing are much more hit-or-miss than the robin of late. But American Robins don’t spend the summer here (as if I’ll get that far in the game!) 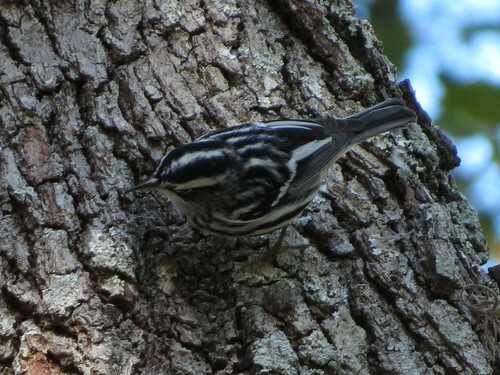 and they typically leave earlier in the spring than other winter birds seen yesterday (Yellow-rumped Warbler, Tree Swallow, etc) – so they were the best choice to check off in the challenge. So far this game has been messing with my birder mind. 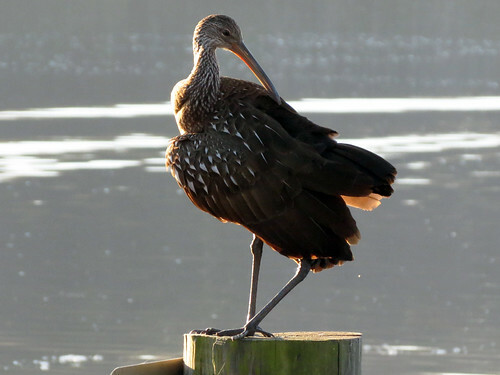 When I found a Limpkin at Lake Monroe Park on January 8th, I knew it was the bird of the day, even though it was early in the morning. I don’t find Limpkins on local outings very often, and I was sure I wouldn’t find anything better later while peeking at yard birds throughout the day. But I had to bike home from Lake Monroe Park first. I found myself half-hoping the Wild Turkeys and Northern Bobwhites would keep out of my view. Those birds were one- or two-hit wonders last year, and though I am ALWAYS on the lookout for them to cross my path, I kinda sorta did NOT want to see them after I got Limpkin in my mind for the day. 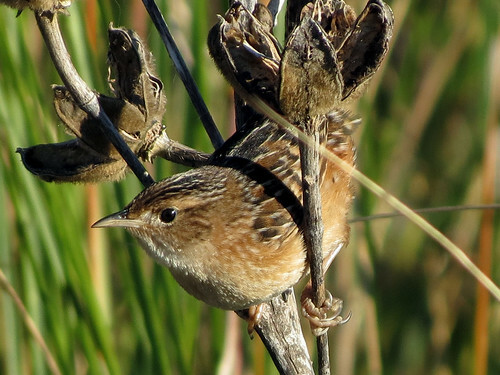 A birder who doesn’t want to see seldom-found patch birds? Crazy. Regrets? I’ve had a few. Well, maybe just one. When I saw a Gray Catbird on the Spring-to-spring Trail back on January 5th, it was my first catbird of the year, and only my third one since moving to Florida. Since recording the Gray Catbird as my bird for that day, I have seen Gray Catbirds six more times; it seems I’m seeing them every third day or so. We even had one in the yard – two different days! 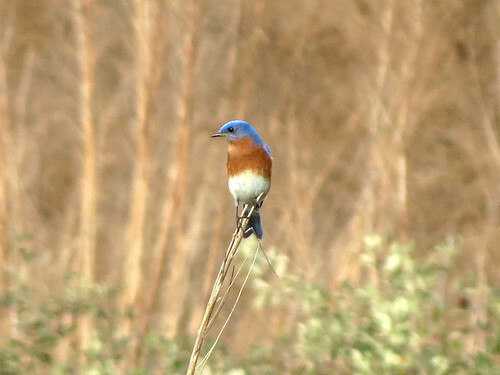 A better choice for that day might have been Eastern Bluebird (recorded just 3 times; used later), or maybe Killdeer (also 3). But it’s too late for that! I’m relieved to get further in the game this year than 2011, even though I didn’t really think it would be too hard. Onward to February! 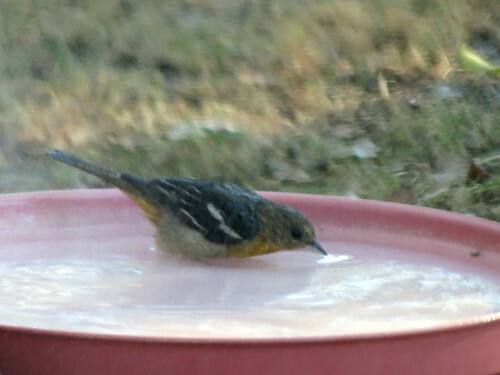 This entry was posted in Bird-a-Day Challenge, Florida, Gemini Springs, Yard Birds. Bookmark the permalink.